While Manitoba and Saskatchewan are sometimes overlooked as attention is drawn to Alberta’s hot petro-economy, both provinces have seen strong growth this past decade. Coupled with northern Canada, this region offers considerable opportunities for new construction in the apartment market. In Saskatchewan, the opportunities are driven by a rising commodities market, especially in oil and potash. Saskatchewan’s population is rising and it is no longer considered a “have not” province. New construction has been slow to start, with only 441 units added to Saskatoon, and no new construction in Regina, but the opportunities for new construction are strong and growing stronger. There is room for new construction, and it is overdue in Regina. In Manitoba, Winnipeg’s market is very strong. In 2010, Winnipeg had the tightest apartment market in Canada with a vacancy rate of just 0.8% within its apartment universe of 52,319. Vacancy rates are still low, and average rents have increased in all apartment categories. In the north, activity is picking up around such centres as Yellowknife and Iqaluit. Although the markets are small, populations are already increasing, thanks to the improving commodities market, and the increasing likelihood of resource development in the Canadian Arctic. New housing projects are already underway. A rental development has been proposed for Iqaluit’s central business district. Manitoba also benefits from the increased economic activity in the Canadian arctic, as they have a well-developed port at Churchill whose traffic has already seen an increase in recent years. Economic activity shipped through Churchill feeds back to Winnipeg. 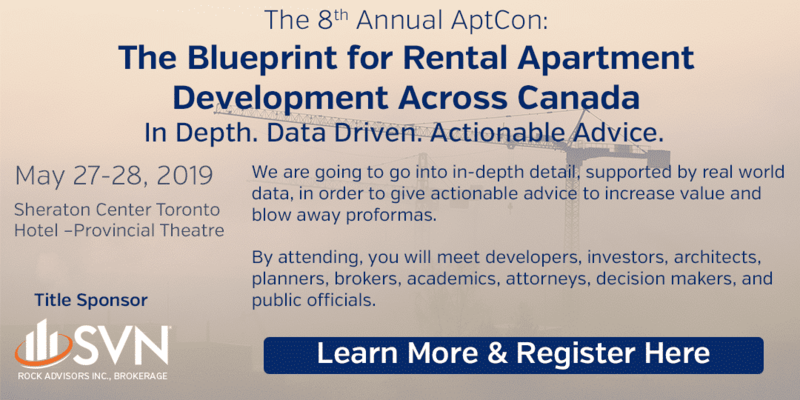 These same economic realities carry over into northern Ontario, which has not yet taken part in the apartment boom seen in southern Ontario, but where vacancies are tightening and average rents are rising thanks to growing strength in the resource sector. Manitoba, Saskatchewan and northern Canada are at the beginnings of a new construction boom. The first investors have already entered the market, expecting strong returns over the long term. The markets are tight, but development hasn’t reached the heated pace of neighbouring Alberta or southern Ontario. COUPLED WITH NORTHERN CANADA, SASKATCHEWAN AND MANITOBA OFFER CONSIDERABLE OPPORTUNITIES FOR NEW CONSTRUCTION IN THE APARTMENT MARKET.